Nice to see my original post has been so active! Off to Prid again this evening in search of the mystery pool. Aiming to get there around 19:00 if anyones about - always fun meeting fellow Cavers! Hey ill meet you there if you want, i drive a bmw with a mountain rescue banner on windscreen at 1900? Sorry folks I was away from my PC most of yesterday for a variety of reasons. Les - your post above is exceptionally useful - thank you. I have just been looking at Hooper's 1957 survey and see that the Zero datum is the entrance so the 44 at the surface of the Lake is 44 below that. As the entrance slopes significantly it would be important to know exactly where the datum was established. From there you can then estimate the height above mean sea level. For the record this was the lake level on 16th October 1990. My maximum depth on the dive was 29 metres but I cant remember if that was in the chamber or at the bottom of the lake. Regarding the altitude of the Lake surface, I think Les has answered that one. If it's so far above sea level then the existence of submerged stal is unlikely to be related to falls in sea level (in glacial periods) with related falls in sump level. So if those stals do exist down to -12 m there must be another mechanism. A couple of CDG members who dive there now and again have contacted me and kindly offered to make a point of looking next time they're there. I've also been pointed to a DSS reference which mentions stals at -3 m at least. The water table varies by more than 3metres at times. Thanks for that. I spent a useful hour last night going through all CDG Newsletter dive logs for the Lake in Prid. Several refer to the level of the water relative to the platform; the greatest difference suggested in all these logs is 3.25 m (2.5 m above to 0.75 m below). Of course divers may not have visited in the driest or wettest conditions. Bear in mind the platform has been built and rebuilt over the years but roughly in the same place. If it is any help on my first visits in the late 60's the water would be below the base of the platform. That's when we saw the young eel. We have an enormous amount of rain!! For those who are interested a small group of us visited Prid yesterday. My first visit for 5 years according to my log. Water levels were high but not as high as I have seen them or as high as they were 4 days ago apparently. The water levels had dropped by 1.5 metres probably which considering the volume of water in the cave is interesting. Some years ago I observed a marked flow from the lake into the Mystery Pool series. I have always wondered if the increase drip of water into the lake is sufficient to account for the water level rise and I am now thinking we are missing something. In Deep Well yesterday there was an equally strong flow out of Flooded Rift suggesting water flows through the system from the Lake across to Flooded Rift and then out via the Well. It will be interesting to see if the mud choking the floor of the Deep Well is therefore flushed out with time. As regards points of water ingress into the Lake I have been told that one caver noticed right at the far end of the Lake, on one occasion, a distinct jet of water hitting his feet. I don't know what conditions this was under but is interesting. It is particularly interesting in relation to a report published in a Cerberus Journal in April 1992 (referenced to a PCG Newsletter of the winter of that year) that a Paul Craggs had, in a series of dives, explored about 45 metres of passage only 6 metres below the diving line leading to Prid 2. Enquiries regarding this recently suggest this was a spurious report but if there is any truth at all it might suggest a location for the point at which water enters the system. If anybody has the original PCG report on can shed light on this I would be interested. It is worth noting that there is also a diveable sump in the far reaches of DogHole. That's useful, thanks. How high do you reckon the water was 4 days ago relative to the present diving platform? I'm still trying to establish the difference between highest and lowest water levels as closely as possible. Given the appalling weather you've had to suffer in the south west lately, I guess this a good time to be asking about highest water level. Along these lines - what's the lowest water level below the platform anyone can remember? In The Old Ruminator's 1990 image one can see two rock projections (The Groynes) just clear of the water. In low water conditions these are well clear of the water such that you can swim under them. The water doesn't start to get deep until beyond them. So on occasions the Groynes can be well above water level and at other times totally submerged such that the water reaches only a metre below the arch above them as in the photo taken yesterday. Go to this link and after scrolling past the other pics you will find Prid on the end and an image that shows the arch above the Groynes very clearly. I certainly experienced the undercurrent three nights ago but not last night i was going to start a new thread! I still maintain that when i went down at the beginning of january it was of record height as seen in my video the top arch was 12 inches above the water, in the above photo from ruminator those guys would of been in the water! Many thanks. I didn't see any stals either but sometimes they're not always so easy to spot; they may not look like normal due to partial resolution. Some of those we've found recently elsewhere have dissolved away so much that only small patches remain, Even a small fragment can be dated though - so, yes please, do have a look for us! Could someone let Pitlamp know I've just been reading through some old documents and you may like to know Edgar Reed and Lt J D Graham dived the lake on the 5th of March 1952 and reported stals at appx 40 feet!!! That's extremely good of you to take the trouble to pass on that information; thanks. In fact Christine (who often posts on this forum) recently supplied me with the actual reference (in a DSS publication). 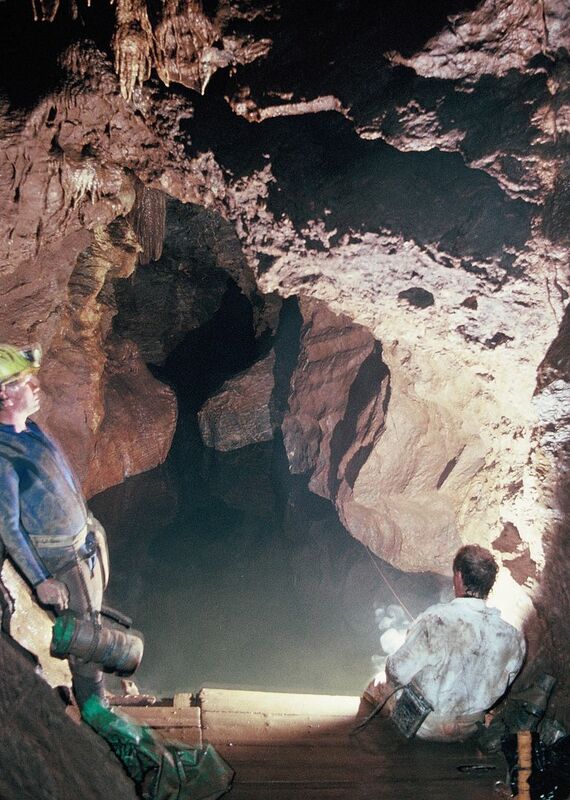 I understand that there is some question about the reliability of that report, in that the divers weren't actually cavers so they may have been less skilled in recognising stal than most of us. But there are two regular users of this forum who have (separately) offered to look specifically next time they get a chance to dive in the Lake. If those stals really are there at -12 m then I suspect Devon would have the deepest recorded stals in the country (beating those in Kingsdale which are at -7.2 m max). It also been pointed out to me that those stals observed in 1952 would be in the first shaft directly below the Prid Lake rather than in Prid 2, as the latter wasn't discovered till much later (early 70s). I really hope they're there because it'd really get our cave scientists scratching their heads as to how they came to exist at such depth! Of course the simple answer is that they were not formed at that depth but that base level has risen by that amount since their formation. I am not sufficiently au fait with Devon geomorphology to take a stab at when that might have been, but would like to hear Don McFarlane's opinion on dating them. In Kingsdale the explanation is closely related to the valley's glacial history (see two articles in Caves & Karst Science in recent years) but I suspect that Prid is in a completely different topographical situation, as well as having been less influenced by the Pleistocene ice advances. Before anyone devotes too much time to this we ought to get confirmation (or otherwise) of the existence of these deep stals - and preferably get a sample to help see where this fits into the wider chronological picture. The south coast of England is a submergent coastline which contains many rias, including Portsmouth Harbour, Langstone Harbour, Chichester Harbour, Pagham Harbour, Southampton Water, Poole Harbour, the estuaries of the Exe, Teign and Dart, the Kingsbridge Estuary, and Plymouth Sound in Devon, and the estuaries of the River Fowey and River Fal in Cornwall. *Well it is when it backs me up.